Spray 5-quart slow cooker with cooking spray. Rub beef with oil; sprinkle with salt. In 12-inch skillet, cook beef over medium-high heat 3 to 5 minutes on each side or until browned. Transfer beef to slow cooker. In large bowl, mix tomatoes, onion, chipotle chiles, garlic, chili powder, brown sugar, cumin and coriander. 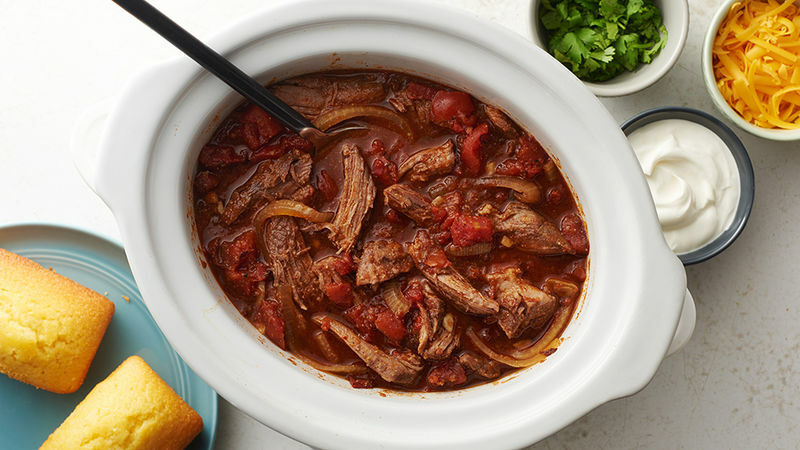 Pour mixture over beef in slow cooker. Cover; cook on Low heat setting 7 to 9 hours or until beef is tender. Meanwhile, stir cornmeal into liquid in slow cooker. Cover; cook on High heat setting 15 to 20 minutes or until thickened. Stir in beef; heat through. Serve chili with cheese, cilantro and sour cream. Remember to trim the fat from the beef. Some fat in the chili is fine, but large pieces of fat left on the outside of the beef will make the chili greasy. Make it your own – for extra heat, use shredded pepper Jack cheese instead of Cheddar, or top with diced avocado, sliced radishes and green onions for extra freshness and crunch.